LONG BEACH — Strictly Sail Long Beach, an all-sailboat show that runs through Oct. 27 at Shoreline Village at Rainbow Harbor, is rolling out even more sailboats and gear for show-goers to view — and seminars for novice and experienced sailors alike to attend. With the America’s Cup having just come to a victorious close for the U.S., the event’s producers could not have chosen better timing. Sailing is hotter than ever. 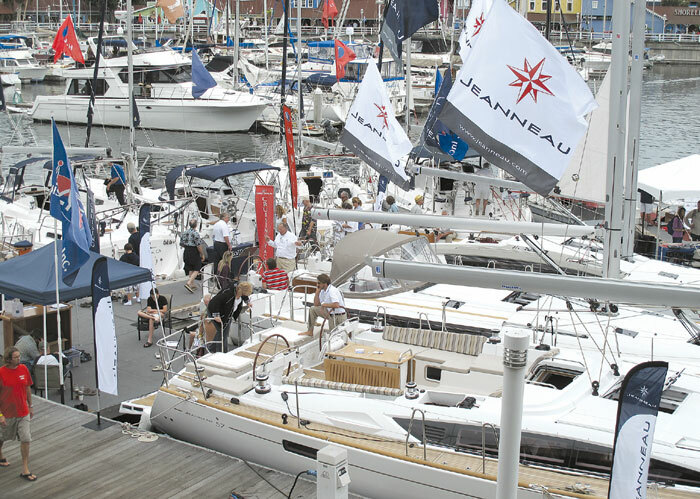 Strictly Sail reached an attendance boost of 90 percent last year, as a result of people wanting to go to a sailboat show, said the event’s executive director Dave Geoffroy of the National Marine Manufacturers Association, a longtime manager of the show. Last year, it changed from featuring both sailboating and power boating, to return to its roots as an all-sailboat show. “When it comes to sailing, we’ve got the newest technology out here,” Geoffroy said. The event will feature seminars to foster new sailors, along with on-the-water lessons offered by professionals. But if you’re not ready to get wet, there’s always the sailing simulator. Originally created in England, the simulator consists of a 12-foot Capri sailboat mounted to a machine that moves the vessel on its axis. “When you move the tiller, the boat moves — so, you can feel what it’s like to catch the wind at the right angle, go downwind — it s pretty neat,” Geoffroy said. For those interested in more advanced boater education, show-goers can come face to face with a “guru” of sailing systems, Nigel Calder. He will lead seminars in hassle-free anchoring and docking, DC systems and do-it-yourself engine maintenance. Also new to the event is Lee Chesneau, a former senior marine meteorologist for the National Oceanic and Atmospheric Administration, who will offer a full day of comprehensive seminars to improve boaters’ understanding of how to gather weather information. There are opportunities to involve the whole family, including kid-friendly Create a Boat toy boat-building, and remote control boat sailing workshops, featured throughout the weekend. Additional attractions at Strictly Sail Long Beach include the Fred’s Shed Interactive Learning Center, a hands-on clinic that offers practical and professional advice on maintaining, repairing and upgrading boats and engines. The show also features Discover Boating Hands-On Skills Training. Hours for the show are noon-7 p.m. Friday, 10 a.m.-7 p.m. Saturday and 10 a.m.-6 p.m. Sunday. Call (714) 633-7581 or visit strictlysaillongbeach.com for more information.